Dr. Steven Clute is originally from Anderson, Indiana. He earned a Bachelor of Science in chemistry from Ball State University in 1999. Then he attended dental school at Indiana University, where he served as vice president of his dental class. He earned his Doctorate of Dental Surgery in 2003 and went on to practice in a family dentistry office in Anderson. In 2006, Dr. Steve pursued an opportunity to provide dental care for children and young adults in Fort Wayne. Since moving to Fort Wayne, he has been working primarily with children and finds great satisfaction in treating kids of all ages. In 2011, Dr. Steve received privileges from Parkview North Hospital, and he began treating qualified children under general anesthesia in a hospital setting. Dr. Steve is a member of the American Dental Association and its local affiliate, the Isaac Knapp District Dental Society. He also maintains an affiliate membership with the American Academy of Pediatric Dentistry. Dr. Steve and his wife April have two sons, Evan and Alex. He enjoys spending time with his family and friends. His interests include snowboarding, games, music, “Star Wars,” and barbecuing. Dr. Steve has enjoyed helping to coach a local youth football team, and is an avid Colts fan and season ticket-holder. 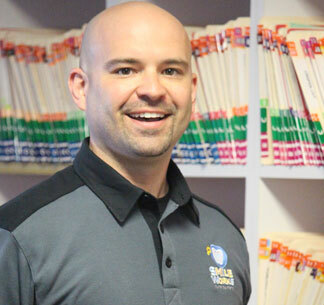 Dr. Steve looks forward to each day that he gets to treat children, and anticipates helping your children have a great time while visiting us!